Jean (Edna) Witt passed away unexpectedly on Sunday, April 7, 2019, at the age of 94 at Community Memorial Hospital in Menomonee Falls. She was born on July 13, 1924, the daughter of Leslie and Alice (Nee: Sumpter) Phelps. 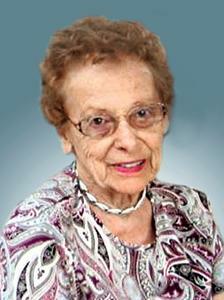 Jean was a lifelong resident of Racine, Wisconsin. In the final 2 ½ years of her life, she moved to an independent apartment at Dickson Hollow Presbyterian Homes in Menomonee Falls. She was preceded in death by her parents Leslie and Alice Phelps and husband Frederick Witt. She is survived by her sister, Marilyn (Robert) Osenga, niece Gretchen (Chuck) Augustin and nephew, John (Sally) Osenga. Also survived by great nephews Joseph (Amanda) Osenga and David (Karen) Osenga; great great nieces Ellie, Becca, and Natalie Osenga and great great nephew Tanner Osenga. Jean worked as a legal secretary for over 30 years. After retirement she volunteered at Orphaned Kanines for over 25 years. She had a tremendous love for all animals but especially dogs. Services will be held on Friday, April 12th at Plymouth Congregational Church, 1143 College Ave. Visitation will be at 10 am with a service at 11 a.m. Interment will be held at West Lawn Memorial Park. In lieu of flowers, memorials can be made to Plymouth Congregational Church or the Wisconsin Humane Society.